When a horror movie opens with elevator music and a shot panning across a city skyline, you know it’s going to be special. Not especially good, but definitely special. Manos: The Hands of Fate is that movie. 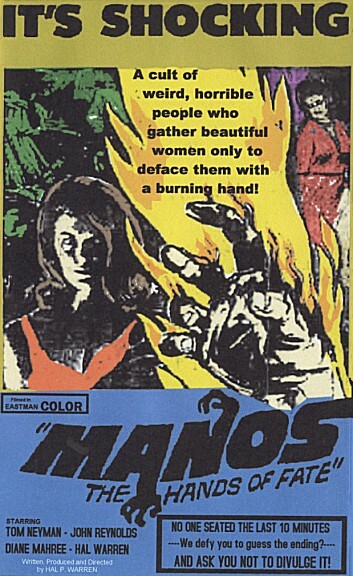 Manos, at the time of its production in 1966, cost somewhere around $19,000 (about $140,000 in 2016), and though it shows in the finished product, no amount of money could’ve saved it from its production and direction. You’ll see several points throughout the movie in which footage is used for no reason other than to – one can only assume – make the movie longer. Seeing the whole thing is only 70 minutes long, it might’ve needed it to look good on paper. This, combined with the musical score, which never truly diverges from experimental, free-form elevator jazz, as well as the mannerisms of the actors, who all act stiffer than cubic zirconium, makes for a movie that’s definitely unsettling. Scary, however? That’s up for interpretation. As for the plot, a husband, wife, their daughter, and their dog go on vacation to a hotel named “Valley Lodge,” except they get lost and never find the lodge. They do, however, find a farmhouse with a hobbling, drunken-looking “satyr” named Torgo waiting outside. He claims to take care of the house “while the Master is away”. Being lost and having nowhere else to go, the family cuts a deal to stay for the night. However, it turns out “The Master,” as depicted in a painting in the house, looks like someone you wouldn’t want to mess with. He also has a thing for hands, evidenced by his collection of hand sculptures on display. If I go any further, I’d be delving into spoiler territory, so let’s just say it involves Torgo getting jealous over all the girls “The Master” gets or something like that – at least it’s not completely wrong. Also, a young couple keeps getting busted by the cops for making out on the side of the road ten-ish miles away, which is relevant to the plot for some reason, I’m sure. Manos was produced, directed, and more, by one Harold P. Warren, an El Paso, Texas-based insurance and fertilizer salesman involved in the local theatre scene. Warren made Manos on a bet with a screenwriter that he could make an entire horror film on his own. He won the bet, because nobody said the film had to be good. It was shot on a hand-wound, 16mm film camera that could only take 32 seconds of footage at a time, which makes the extensive filler footage in the movie an impressive feat. John Reynolds, the actor who played Torgo, shot himself in the head with a shotgun a month before the film premiered. I mean, who can blame him? The actors referred to the film as Mangos: The Cans of Fruit when Warren wasn’t around to hear it. Because the film lacks a copyright symbol, which at the time was required for films to be eligible for copyright within the United States, the film is believed to be in the public domain (at least in the States). Like most bad movies, you should watch Manos – not in spite of its flaws, but because its flaws make it entertaining. However, if you think you like bad movies because you watched Sharknado once, prepare yourself – this one separates the men from the boys.